Angelo Dibona, the symbol of Cortina d'Ampezzo's Alpine Guides. HomeHistory Do you know who Angelo Dibona was? Angelo Dibona, a great mountaineer. Angelo Dibona “Pilato”- 1879 to 1956 – unrivalled symbol of Cortina d’Ampezzo’s Alpine Guides, is considered one of the 20th century’s best climbers. During his fifty year long career he climbed Italian, Austrian, German, French, Swiss and Slovene mountains and even England’s cliffs. He opened up seventy or so rock and ice routes pushing the 5th grade to its limits and beyond and standing out for courage and the ease with which he moved across every sort of terrain. 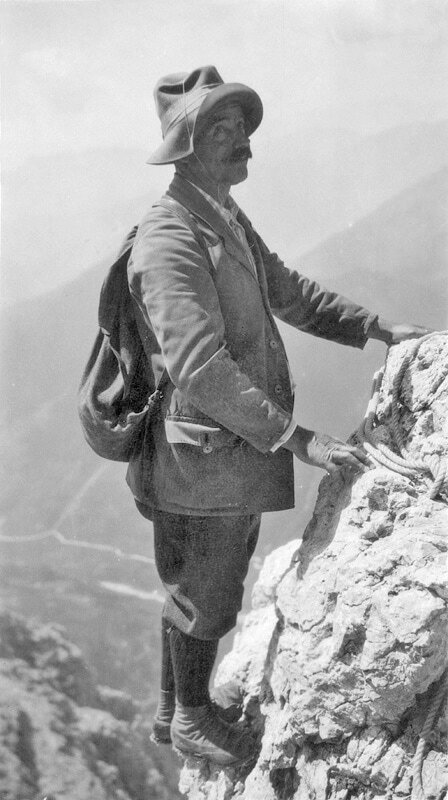 Angelo Dibona was not only the most famous Dolomite guide of his era but also, with Paul Preuss, the most important mountaineer of the period immediately preceding World War One. No contemporary climber rivalled the number and grandeur of his first ascents. Almost all of the “Dibona routes” are ultra-elegant requiring not simply great technical skill but also significant stamina from mountaineers. His first ascents were done at a relatively advanced age. Angelo Dibona possessed that specific instinct which only men who have grown up in the mountains have. He was capable of identifying the most logical route for a climb from the conformation of the rock face itself and had no need of additional information. He was uninteresting in reading about the Alps and preferred to trust nature and his instinct. His nose for danger – rock falls, landslides, storms – enabled him to come out of many potentially risky situations unharmed. I will not attempt here to list Dibona’s many, legendary first ascents and simply note the route opened by Dibona and Luigi Rizzi with brothers Guido and Max Mayer on the ultra-high and daunting south-west face of Croz dell’Altissimo (Brenta) where Angelo, entirely in free climb, climbed sections of grade VI- in 1910 (YDS 5.9 – see UIAA rock climbing grades). On the climb’s key section, the famous “masso squarciato” – the “slashed boulder”, an overhang split in two by a crevice which protrudes out into the void by several metres – Dibona used two of his lifetime total of fifteen pitons. 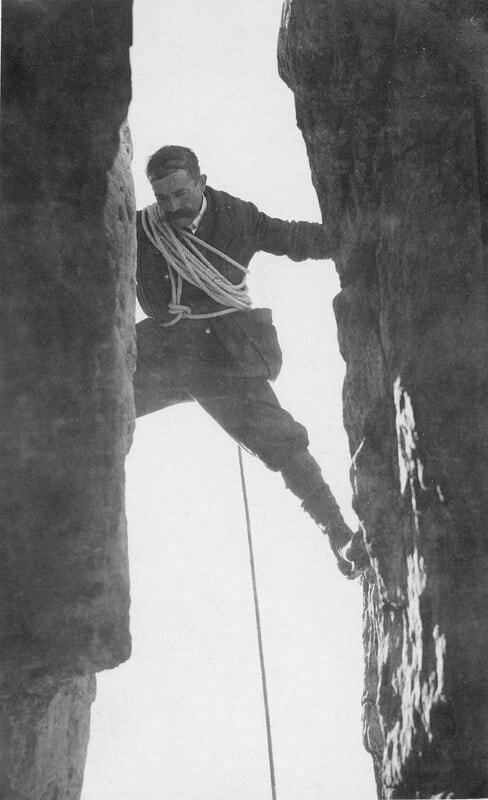 Paul Preuss and Paul Relly, on 3rd August 1911, were the first to attempt it after Dibona and it is known that Preuss – the king of free climbing – took over two hours to get past this key section, a cause of some irritation to him. Some eminent mountaineers consider it a VI grade section and if this is true then the history of Dolomite mountaineering, which considers the first VI grade to be Solleder on the Civetta massif in 1925, will have to be rewritten. This 1000 metre high rock face was the site of Dibona’s true tour de force. It is a shame that his successors did not follow in his footsteps on this route as far as purity of style is concerned (the second ascent by the great Preuss excepted) but used a multiplicity of pitons where he had used none. Mayer said of him: “Dibona is not one of the best climbers in the Dolomites. He is the best climber in the world”. In 1947 the Appalachian Mountain Club reported that Dibona was still doing “spectacular” rock climbs at the age of 65. 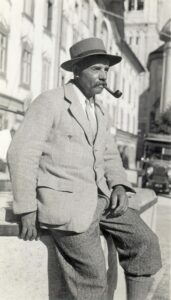 Piazza Angelo Dibona in Cortina d’Ampezzo has sported a bronze bust of the mountaineer since 1976, the work of famous Falcade artist Augusto Murer. Rifugio Dibona, at the foot of Mt. 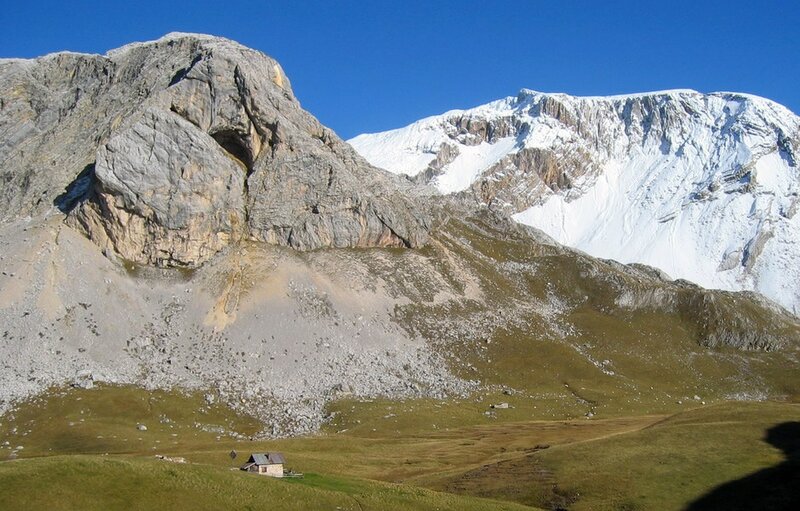 Tofana di Rozes’ imposing south face, was called after this great man of mountaineering. I’m certain that Angelo would have appreciated the choice of place, half way between the forests and the vertiginous rock faces. Dibona’s mountaineering success did not lead him to repudiate his peasant origins. His was an independent character and he will certainly remain one of mountaineering’s greats. I believe that very few people know the details of the way he started out as a climber. In Angelo’s memory, as one of the most talented European climbers of the 20th century, now almost better known abroad than he is at home, I will describe his “first ascent” here. As a boy Dibona Angelo passed his summers in the mountains looking after cattle like many of his peers. It was perhaps 1891 and with his cousin Damiano, also later an Alpine Guide, Angelo was working as an assistant shepherd at Cason de Foses on pastures which have been used for sheep pasture for centuries. One day, with a little free time on their hands, the two boys made their way towards Mt. Croda Rossa, attracted by the cave which is visible above the pastures on a knoll overhanging Lago Gran, called Caštel de Foses. The cave was nicknamed “el buš de ‘l oro” – the gold hole – and the herdsmen believed it contained treasure. Nobody had yet dared find out, however. Curious, Angelo wanted to see for himself whether the rumours were true and he thus left Damiano on the grass and climbed up a long vertical rock face to the cave. He immediately realised that there was no gold up there but simply scree, dripping water and bird droppings and decided to go back down, but found himself in difficulty right away. His cousin, who had watched the climb through a telescope, shouted to him to try to the right. Angelo crossed a slender, unstable ledge with handholds only, trembling with fear, and after a few endless minutes, succeeded in getting his feet onto a small grassy ledge before slowly returning to the bottom. It was his first climb: he was only twelve. In 1907, after passing a course in Villach with flying colours, he obtained his Alpine Guide license and began his first climbs, taking on significantly difficult climbs immediately and always as a lead climber. In the years that followed, every time he passed by Foses, he must surely have cast a glance at what climbers see as an uninteresting knoll, where he had taken the first steps in a long and brilliant career which crowned him king of the fifth grade across the mountains of Europe.